Terriers play their second exhibition game of the season, taking on the NTDP U18s in a 7 p.m. start at Agganis Arena. 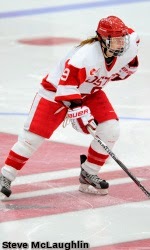 BU, which is coming off an 8-1 win at UMass, skated to a 3-3 tie with the NTDP U18s in 2011-12. In that game , current Terriers had a hand in each U18 goal. Matt Lane opened the scoring for the U18s. 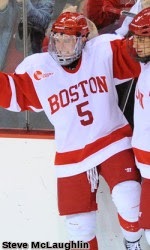 After BU took a 3-1 lead, Matt Grzelcyk, the current BU captain, assisted on the U18s second goal. Then in the third period, Nikolas Olsson’s goal knotted the score. Coach David Quinn has indicated that the BU line-up is likely to the same as in last week's victory at UMass. As of Thursday, junior goalie Matt O'Connor remained "iffy" for the contest as he recovers from a low-body injury. If he's unable to play, freshman Connor LaCouvee, who impressed against the Minutemen, would likely get the start. Two future Terriers, 2015 recruits left wing Jordan Greenway and right-shot defenseman Charlie McAvoy, will make their first Agganis Arena appearance tomorrow. Harvard 2015 recruit Ryan Donato, who plays for former Terrier Dan Donato at The Dexter School, will join the U18s for tonight’s game. Since the National Team Development Program was launched in 1996, 26 of its alums (full list) have gone on to become Terriers. The first was Pat Aufiero and the most recent are freshmen Jack Eicher, Brandon Fortunato, Johnathan MacLeod and Nikolas Olsson. 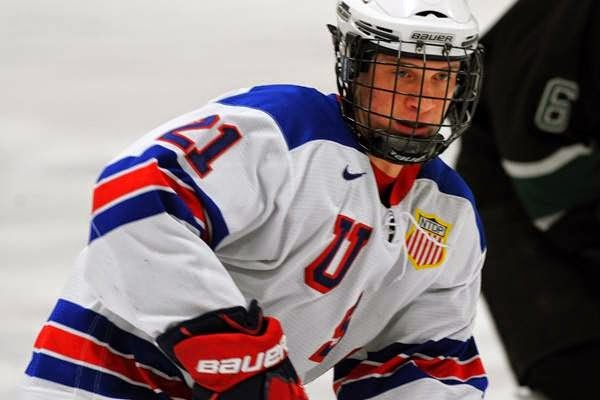 Other NTDP alums on the current roster are Matt Grzelcyk and Matt Lane (photo). In addition, Danny O’Regan joined the U18s for the 2012 World U18 Championships, winning a gold medal, along with Grzelcyk and Lane, and J.J. Piccnich suited up with the U18s for one game last season. Head Coach David Quinn served as head coach of the NTDP U17s and in 2003 was named the USA Hockey Developmental Coach of the Year. Of the 51 NTDP alums now in the NHL, four are ex-Terriers: Colin Wilson (Nashville), Matt Nieto (San Jose), Kevin Shattenkirk (St. Louis) and Brian Strait (NY Islanders). ► Canadian fans will have unprecedented access to college hockey game telecasts through a new partnership between TSN and College Hockey Inc. Thirty-seven NCAA games, including 20 Hockey East games, are on the telecast schedule. BU games to be aired are: Jan. 3 vs. Union, Feb. 2 vs. Harvard (Beanpot) and Feb. 13 vs. New Hampshire. The Hockey East semifinals and championship game also are on the TSN schedule. ► Join the Terriers in the 14th Annual Greater Boston Walk Now for Autism Speak on Sunday, Oct. 19 in Mansfield, Mass. Details. 2015 recruit Bobo Carpenter scored the go-ahead goal in Sioux City's 4-2 win over Omaha. 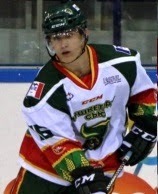 2015 recruit Maxim Letunov scored his fifth goal in six games in Youngstown's 5-4 OT loss to Dubuque. David Van der Gulik scored his first goal of the season for AHL Manchester in a 3-2 loss to Norfolk. #6 Terriers began their weekend pair with #7 Clarkson by defeating the Golden Knights, 3-1, at Cheel Arena in Potsdam. Following a scoreless first period, BU took a 2-0 lead in the second on goals by Dakota Woodworth and captain Marie Philip-Poulin. Shortly after Poulin’s goal assisted by Sarah Lefort (photo), Clarkson cut the lead in half on Erin Ambrose’s goal. Lefort restored the two-goal margin with her second goal of the year, unassisted. Sophomore netminder Victoria Hanson stopped 19 of 20 shots en route to improving her record to 2-0. The teams will play again today with puck drop at 3 p.m.
► Poulin has been named to the roster of Canada’s National Women’s Team for the 2014 Four Nations Cup set for Nov. 4-8 in Kamloops, B.C. Also on the roster are former Terriers Jenn Wakefield, Tara Watchorn and Jenelle Kohanchuk.